What is certain is that aborigine culture ignores the brutal realities of its own existence and focuses on what is now called the dreamtime. The word dreamtime itself is a mistranslation of the Aborigine word alcheringa, which means the uncreated source; a source which was always there, which perpetually yields fresh materials from which everything that is perceived is derived. To the aborigine the dreamtime is an altered state of consciousness that lies across the uncharted chasms of the mind, a place where everything that ever was has been imprinted forever in the aether. Nothing that was, nothing that is, can be lost and it can always be accessed by going back to the beginning through ceremonies and dreams. The idea of Akashic records go back no further than Madam Blavatsky and Theosophy, a system of mysticism which she founded. Akasha simply means aether in Sanskrit. If Blavatsky and her followers got the idea from anywhere other than a library that there was an astral hall of cosmic records it was from Tibetan lamas schooled in the all but forgotten ways of the ancient Bon religion. Bon was the mysterious religion of Tibet before Buddhism, a primal type of animism that believes all things animate and inanimate are sourced from an invisible world. In the Holographic universe, quantum entanglement the enigma of superluminal interaction between particles –what a baffled Einstein called “spooky action at a distance,” petulantly denying its existence in the face of all the evidence (even then) 6 – is easily explained. What are being observed in particle physics are not particles at all, but different aspects of interference patterns generated by the collision of spherical frequency waves emanating from an Event Horizon. The Holographic paradigm postulates, in fact takes it as a given, that at the threshold of the time-space continuum, what physicists call the cosmological horizon, lay the source of everything that is, ever was, or will be. The information that composes the universe is never lost or changed. It’s immutable and is broadcast in oscillating signals, generating a chaotic sea of fluctuating frequencies that are picked up by mans senses and translated by the mind into the three dimensional world in which he finds himself. Pribram died in the beginning of 2015 at the age of ninety-five after a long and distinguished career working side by side with such giants in science as BF Skinner, Jon von Neumann and David Bohm; arguably the most brilliant physicist that the Anglo-American empire produced during the twentieth century. Bohm collaborated closely with Pribram in the formulation of the Holonomic brain theory, but his earlier radical communist political affiliations would have barred him from the inner sanctums of the Stanford Research Institute. In the same interview, from years ago, Pribram explains that “when an input comes in through one of the senses to the brain, it has to then become encoded in some way so that there is a representation.”8 Pribram calls these representations memory traces and says they have no localized point of origin in the brain. But the overall method by which these memories are spread throughout the brain, enabling them to avoid damage from injury, has always been a mystery. The idea that the cerebral cortex was interpreting interference patterns can be traced back to Germany in 1906.11 Decades later, John Lashley, Pribram’s mentor at the Yerkes Primate Center, reached the same conclusion. Interference patterns can be seen in the water if you cast two stones in a pool. When the series of concentric waves generated by each of the stones clash the resulting confused ripples or wavelets are interference patterns. In the interview Pribram asks “what might constitute those interference patterns in the brain” and “given interference patterns, how do you get an image out of that?”12 He then answers his own questions saying both problems were solved when people started building holograms at the University of Michigan and at Stanford (around 1962). He qualifies that by saying “because a hologram is a photographic store of ripples, of interference patterns. Instead of pebbles on a pond, what you have is light beams hitting the film.” 13The light then spreads in ripples over the surface of the film. In a hologram that spread function is translated into images and with every passing year in neuroscience it becomes more and more apparent, Pribram uses the word “overwhelmingly,”15 that the brain functions in the same manner. Holography works by using interference patterns to encode information about a three dimensional object into what is, for all intents and purposes, a two dimensional light beam. The interference patterns can then be translated back into a three dimensional object. A tremendous amount of information can be stored and transferred this way. Another profoundly functional feature of the hologram and analogous to the non-locality of memory in the human brain, is that all information is stored throughout the entire hologram. As long as a part of the hologram is big enough to contain the interference pattern, it can recreate the entire image stored in the hologram. Holographic technology is based on the Fourier transform, a type of integral transfer sometimes called an improper Riemann integral. The Fourier transform itself is a mathematical function originally used in the nineteenth century to show the transfer of heat between two systems. Fourier transforms are the foundation of Spectral Analysis in the late twentieth and early twenty-first century. The father of the Holograph is 1971 Nobel Prize recipient Dennis Gabor, who right after WW II produced the math –called windowed Fourier transforms– necessary to make one. Gabor served in a Hungarian artillery unit during WW I and in the twenties was instrumental in the development of the electron microscope in Berlin. When the National Socialists came to power in 1933 Gabor, a Hungarian Jew that had converted to Lutherism, fled Germany to England. By the time Gabor worked with them, Fourier transforms had been infused with the genius of Bernhard Riemann, the nineteenth century German mathematician who broke the back of Euclidian geometry for good, making quantum physics and relativity possible. Erwin Schrödinger, the twentieth century Austrian physicist whose wave equation would become one of the two pillars of quantum physics and the foundation of wave mechanics. Gabor would have at least had access if not worked directly with the legendary Jon von Neumann, Hilbert’s best pupil. Gabor and von Neumann were both Jews, native Hungarians and born to money, although von Neumann’s education under Hilbert had been paid for by the Rockefeller Foundation. Von Neumann was in fact titled nobility, besides being the man who named Hilbert’s Space in Hilbert’s honor. At Princeton, von Neumann delighted in playing Prussian marching music so loud on his gramophone that Einstein, who was in an adjoining office, would have to ask the authorities to intervene. In vain, there was nothing Einstein or anyone else could do about it. Von Neumann wrote the textbook for Quantum mechanics; Mathematische Grundlagen der Quantenmechanik, or in English Mathematical Foundations of Quantum Mechanics. His mathematical contributions to civilization could fill a library, but his real achievements remain classified till this day. It is said that when von Neumann was dying of cancer, while under sedation he was surrounded by a Special Forces guard to insure he didn’t blurt out any of the empires secrets. Einstein had always insisted that there were hidden variables that when discovered would reconcile quantum physics, which is indeterminate, and relativity, which is determinate. In Einstein’s vision of the future there would be just one unified field of physical phenomena and that would be determinant. In physics, determinant means events transpire as a result of a mechanistic necessity and are therefore predictable. They follow laws. All physical phenomena should follow rules. There is the wave function collapse and quantum randomness in general. If the observer calculates the position of a “sub-atomic particle” in space they cannot calculate its momentum because the very act of locating it influences its trajectory. If they find its momentum, the act of their doing so prevents them from finding its position. That’s the short definition of Heisenberg’s Uncertainty Principle. Erwin Schrödinger, who won the Nobel Prize in 1933 for providing the equation that makes it all work, was more than just a scientist. A philosopher and poet at heart, he was a lifelong student of the Vedas and believed individual consciousness was a manifestation of the universal whole. The Copenhagen interpretation is the prevailing school of thought in quantum physics to this very day. As George Berkeley, the father of Immaterialism and therefore the Copenhagen interpretation, said three hundred years ago; nothing can exist if there is nothing to see it, “esse est percipi,” to be is to be perceived. He would publish his famous equation in 1926. In the twenty-first century, it’s still the tool mathematicians use to describe a wave function. In the Copenhagen interpretation the wave function is the most complete description that can be given to a physical system. Famously, in 1956 Schrödinger would refuse to speak about nuclear energy at an important lecture during the World Energy Conference, giving a philosophical lecture instead because he had become skeptical about the entire subject. He would cause a great deal of controversy in the physics community after that, abandoning the idea of particles altogether and adopting the wave-only theory also put forth by Hugh Everett III in his many-worlds interpretation of the multiverse. In the many-worlds interpretation, the wave in the quantum state is the only thing that is real and under the appropriate conditions it will exhibit particle-like behavior. In Everett’s multiverse, everything that ever could have happened in the past did and every possibility spawns its own universe where that possibility did and does occur. The idea of a pilot wave was picked up and made mathematically feasible by Louis de Broglie in 1927, but with little support from a physics community now enamored by Heisenberg and the Copenhagen interpretation it died a slow death from neglect. Regardless of the value of “Bohmian mechanics” the rest of what David Bohm had to say about the holographic universe may be a summation of everything that was really learned by man in the twentieth century (outside of course all those in this account who had an above top secret clearance…). Bohm said there were two worlds. The primary one he called the Implicate Order or the enfolded order. He said the enfolded order was “the ground out of which reality emerges.”25The other world, “reality,” the world of the human senses, the world where consciousness dwells, he called the Explicate Order or the unfolded order. Bohm, always a pariah to the powers that be because of his politics sometimes had his work classified before he could even finish it. In the Manhattan project he was barred access to Los Alamos and was not allowed to write the thesis for his own scattering equations. Einstein had always been his mentor, shielding him and preventing his ostracism from academia and Bohm had always worked closely with him in Einstein’s quest to save physics as he knew it. But by the end of the war Bohm had come to the conclusion that quantum mechanics would never become a deterministic science. He stopped looking for deterministic mechanisms as the cause of quantum phenomena and set out to show that the events could be attributed to a far deeper underlying reality. Eliade said there are only the Sacred and the Profane. The Sacred is the place of mythology, where the gods and archetypes dwell together with all the things that establish the very structure of this world. The Sacred is the First Cause of the Gnostics, the alcheringa of the Aborigine and the Implicate Order of Bohmian mechanics. The Profane is the material things of this world, the things that have nothing to do with the Sacred. They are basically just like the set in an old black and white movie story… Eliade said they “acquire their reality, their identity, only to the extent of their participation in a transcendent reality.”28 In other words, it is only through its participation in the Sacred that the Profane finds validation. Eliade said that in order to uphold the world of the Profane, the Scared must be manifested into it, over and over again. He called these incarnations, these places where the Sacred intersects with the Profane, the Eternal Return (not to be confused with Nietzsche’s Eternal Return, just as important but more to do with the cycle of the Yuga’s and the Mandela). Eliade called these manifestations of the Sacred into the Profane hierophanies. Eliade maintained that all Shamanic practices in cultures uncluttered by the poisons of twentieth century rationalism, indeed the foundation of all Paleolithic spiritual practices, was an attempt to produce these hierophanies. There has always been something dark and foreboding about Australia. Master of horror H P Lovecraft wrote about it in The Shadow out of Time. There is something menacing, something unspoken and threatening, a nameless fear of the stark and unforgiving land and an instinctual loathing of its native aborigine inhabitants that runs like an unseen current through the hard White men who dispossessed them. In 1770 a British exploratory expedition led by James Cook would land in Botany Bay where the great city of Sidney now stands. They began shooting the natives immediately and the fighting would continue for over a hundred and fifty years. It finally subsided after the Coniston massacre in 1928 in the Northern Territory, which left over a hundred Aborigine dead. The Aborigine bore no animosity towards Whites because of their skin color. Eating the dead was strictly business in a land where distances are endless and the sun relentless. As settlers claimed the rights to all Australia’s fertile land the Stone Age hunting and gathering lifestyle of the Aborigine provided less and less sustenance. Resentment, and hunger, became inevitable. Australia is rivaled for geological anomalies only by its nearest neighbor Papua New Guinea. Both have stood in isolation for what academia says is sixty thousand years. Only their indigenous tribes, more like ghosts than men, can testify as to what cataclysmic events they may have witnessed. Rising like a specter out of the center of the Australian continent and on an otherwise almost unbroken horizon is Uluru or Ayers Rock, an isolated hill that appears like a single great stone has been imbedded into the earth. Uluru, a Mecca for tourists, is famous for its glowing red appearance at dusk and dawn and is sacred to the Aborigine. At two miles long, over a mile wide and eleven hundred feet high Uluru is by far Australia’s best known geological anomaly. But just as striking is Kata Tjuta, fifteen and a half miles to the west and Mount Conner, slightly to the south and forty-five miles east of Uluru. Kata Tjuta or the Olga’s consists of thirty six domes covering a little less than eight and half square miles, the tallest being Mount Olga at over seventeen hundred feet high. Mount Conner covers eight and half square miles and rises nine hundred and eighty-four feet at its highest point. All of them are conglomerates of granite-like stone and gravel cemented by a matrix of sandstone, about 50% feldspar, 25–35% quartz and up to 25% rock fragments. Local Aborigines believe most of the south face of Uluru is the result of a war fought in the dreamtime between the carpet-snakes (Kunyia) and the venomous-snakes (Liru). The northwestern corner of Uluru and most of its north face were formed as a result of the activities of the hare-wallaby’s (Mala) and the comings and goings of other dreamtime entity’s fill in the rest of Uluru’s geological features. Black Mountain National Park is located at the northern end of Queensland, a little over five miles from the Coral Sea. “The park” is just a restricted three square mile area around a pile of dark colored granite boulders, some the size of houses. The pile reaches almost a thousand feet in height. Academics have explanations for this striking geological anomaly but to the untrained and perhaps the more objective eye the boulders appear to have been placed there by unknown methods for unknown reasons. Black Mountain has a sinister reputation among Whites as well as the Aborigine. The Aborigine call it Kalkajaka or place of the spear and avoid it. People disappear around Kalkajaka and the people who go looking for them disappear too. Some believe the missing have simply been lost forever in the labyrinthine passages between the boulders. Others claim the missing were eaten or enslaved by reptilian aliens that, among other things, have been sighted around the rocks. They believe reptilian aliens have a secret base under Black Mountain where UFO sightings are a regular occurrence. The human disappearances in the Blue Mountains seem to be focused around Mount Yengo. Called the Uluru of the east, the flat top of Mt. Yengo rises about a thousand feet above a plateau and is believed by academics to be all that remains of an ancient volcano. 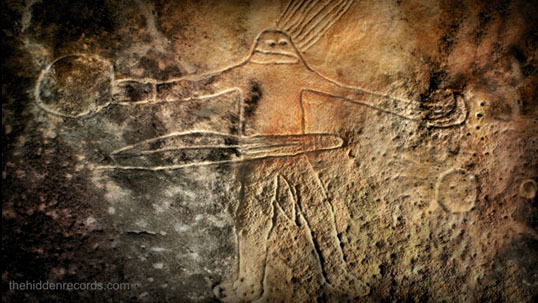 Perhaps because of its prominent flat top, Aborigine tribes believe that after he was done with the act of creating this world their creator god Baiame leapt back up into the spirit world from Mt. Yengo. If the two tiny circles are rotated about two hundred and eighty degrees clockwise or ninety degrees counter clockwise so that the tiny circle that was furthest from Baiame is now in the hilt of the knife you would have close to an image of what, left to right, is in the middle of Australia. Mount Conner would be the large circle, now furthest right. The Three Sisters rock formation is about fifty miles to the Southwest of Mt. Yengo. The three craggy pillars of sandstone tower above the lush Jamison Valley. No doubt conjuring memories in Australia’s early Anglo-Saxon settlers of the three Wyrd Sisters crouched at their cauldron casting spells on both gods and men in Shakespeare’s Macbeth. In the 1965 epic science fiction novel Dune by Frank Herbert the Wyrding Way is an overwhelming close quarter fighting technique used by the story’s messianic hero and his rebel armies with devastating effectiveness. In hand to hand combat its adepts are able to maneuver around and strike their opponents at speeds that resemble teleportation to the observer and words and sounds can be amplified to become lethal weapons. Wyrd is a notion taken from the pre-Christian religion of the Norseman. In Old Norse the word is Urðr. It is also the name of the mother of the Norns, female beings who rule over the destiny of gods and men. There are many Norns, good and evil, who appear at a person’s side at their birth and decide upon their future. Urðr (fate), Verðandi (present) and Skuld (karmic debt) are the most powerful of the Norns and said to have come to intervene in a time long past when the gods ruled too haughtily over men. The three beautiful maidens pour the purifying waters of the Urðarbrunnr (Well of Urðr) over the Yggdrasil (Tree of Life) to keep it eternally rejuvenated. The Urðarbrunnr is said to be one of three wells, one under each of the three roots of the Yggdrasil. Each root reaches to a different far off land. The other two wells are Hvergelmir (bubbling boiling spring), located beneath a root in Niflheim (Abode of Mist), and Mímisbrunnr (Mímir’s well), located beneath a root near the home of the frost jötnar (Giant). It was said that Odin gave one of his eyes to drink from the Mímisbrunnr, the well of wisdom and understanding. Most amateur UFO enthusiasts have never heard of Bruce Cathie and his book; Harmonic 33, published way back in 1968. But most professional researchers are well acquainted with the book and many new age authors use Cathie’s math to validate their Tinkerbellian speculations. This is the cover sentence in Harmonic 33. There are rumors that the original book was immediately pulled from bookstore shelves, edited, then rereleased with Cathie put under wraps and assigned a handler, never to produce anything again of any consequence for the general public, though he would write a few more books. Later one of the scientists who had been on board the Eltanin told Cathie the object was thought to be metallic and an artifact of some kind. Cathie was able to align his New Zealand grid with the coordinates of the artifact fashioning what he reasoned was a world energy grid and perhaps used as a galactic navigational tool by extra-terrestrials. Something is going on in the Blue Mountains, always has been. It’s been categorized by twenty-first century academia as paranormal but it’s something Australia’s aboriginal people are well acquainted with. The Three Sisters crouch at the south edge of the town of Katoomba, an Anglo-Saxon enclave of artists and artisans. They can be viewed from its golf course and are the most famous landmark in The City of Blue Mountains, a ribbon of contiguous towns, which lie on New South Wales Main Western railway line. The City of Blue Mountains has dubbed itself ‘The City within a World Heritage National Park.’ It has Sister City Relationships with Sanda City, Japan and Flagstaff, Arizona in the USA. Located in the southwest of the Four Corners, an area famed for its paranormal activities, Flagstaff is the unofficial capital of the Navaho (Diné) Nation and the Hopi, the priestly tribe who are the keepers of the Diné’s most profound secrets. Like a penitent kneeling at the foot of the alter Flagstaff prostrates itself at the south foot of Agassiz Peak, Freemont Peak and Doyle Peak in the Kachina Peaks Wilderness. The San Francisco Peaks are where the doorways open up for their gods, which they call Kachina, to come forth when they are called in the powerful ceremonies performed by the Hopi. 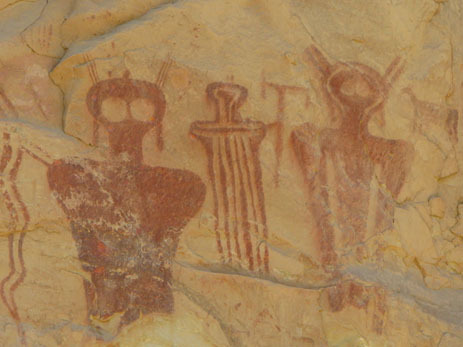 Rock art from Sego Canyon at the northern frontier of the Four Corners. 9 – Ibid. 23:52 – 25:04. 18 – Ibid. – 1. The Completeness of the Quantum Mechanical Description. 20 –Deutsch, David. “The Beginning of infinity,” page 310. 22 – Goldstein, Sheldon. “Bohmian Mechanics.” 3. History. 25 – Peat, David. “Non-Locality in Nature and Cognition.” Nature, Cognition And System II. Page 304, 1992. Web. 21 Aug. 2016: https://books.google.com/books?id=PgPoCAAAQBAJ&pg=PA304&hl=en#v=onepage&q&f=false. 28 – Eliade, Mircea. “The Myth of the Eternal Return: Cosmos and History.” Page 5, Princeton: Princeton UP, 1971. 30 – Bohm, David. “Wholeness and the Implicate Order,” 1980. 31 – Cooke R.N. Rtd., James. ANTHROPOPHAGITISM IN THE ANTIPODES OR CANNIBALISM IN AUSTRALIA. N.p. : n.p., 1997. Print. A privately published collection of documented accounts. 32 – Ibid. Page 3. Henry de Burgh, Diary in Battye Library quoted in The Breakaways by W. de Burgh, St George Books, Perth, 1981. 53 – “Ancient Aliens S11E07 – The Wisdom Keepers.” 27:00.YouTube, 7 July 2016. Web. 26 July 2016. 54 – “NASA and the Navajo Nation.” NASA Astrobiology at NASA Life In The Universe. Ed. Julie Fletcher. NASA, n.d. Web. 16 Sept. 2016. First Step in Rebuilding Jerusalem Temple? Will Jewish incursions at Temple Mount provoke a new intifada? Are George Soros and Saul Alinsky Satanists?